Brushing is a daily habit that, when performed right, keeps our teeth away from plaque and bacteria. There are, unfortunately, some cases where people brush their teeth way too hard which results in the tooth enamel being damaged and torn off, which leads to complications in the long run. 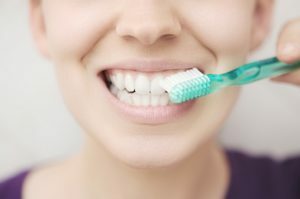 With this article, we want to raise a bit of awareness about how brushing too hard can be harmful for your teeth’s health. We will also offer you some advice from our Los Algodones dentists to help with it! The tooth enamel is what protects the inside of our teeth to changes of temperature and possible infections. It also helps us chew food and handles the pressure from biting as well. By brushing with too much force, or using a hard-bristled toothbrush, we are at risk of tearing off parts of the enamel. This in turn makes it weaker and thinner, and gives more room for other parts to be broken off as well. Gum recession is when your gums pull back. This becomes troublesome as they begin protecting less of the tooth, and can eventually show the roots for bacteria to have an easier time wrecking havoc. If you notice your gums red and swollen, Los Algodones dentists recommend being careful and seek guidance before it gets worse. As the tooth enamel gets worn down, it is easier for changes in temperature to reach the core of our teeth. As such, hot and cold foods alike cause us great discomfort, as well as biting down hard can turn painful. This also links with gum recession as exposed tooth roots are a common reason to suffer from tooth sensitivity. Frayed bristles in a toothbrush. A good sign that you are being rough on your teeth is that the bristles of your toothbrush get worn down and frayed quicker. 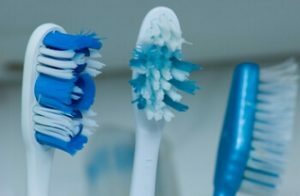 Toothbrushes that are frayed and not in their top condition prove very difficult to use and accomplish their task. It is necessary for the bristles to point in one direction as we are looking to brush that specific area. A good example for this would be a worn down broom, which will obviously miss spots even if we sweep over and over. Brush gently and be thorough. Our goal with brushing is to remove the soft and sticky plaque, as well as food remnants from our teeth. As such it is important to do that on every tooth and every surface we can reach to. A soft-bristled toothbrush is your best bet. These will not harm your tooth enamel and will have an easier time moving and getting to the tiny spaces. They are usually replaced every three months. Make sure to brush against your gum line. A good amount of plaque can be stored within it, which can be troublesome if we were to miss it. As such, by tilting your toothbrush about 45° it should do the trick to remove most of these buildup spots. Include plenty of water and fluoride. Water helps keeping your mouth moist and boosts saliva production, which helps halting bacteria. Fluoride will help strengthening your teeth and help regain lost minerals in the tooth enamel. Visit a dentist twice a year. This is the best way to know you are doing famously. A professional dentist can check the state of your mouth, help you improve it the fastest way possible and keep track of how it changes through time. There is no way to lose here! Bleeding Gums: Why And What To Do? No Replies to "Why You Should Not Brush Hard"